One of the great things about being a blogger, is that you sometimes get opportunities offered to you that you think sound fun. Sometimes, I say yes to these even though I have no right being offered them, being part of the Bostik Craft Club was one of these opportunities that I felt that I shouldn't have been offered as I am terrible with arts and crafts. I want to be good with arts and crafts, but I'm not. Then again isn't that why you all love me? I'm not a perfect cook or craft person, I'm normal (normal is relative!) and for the most part, most of you lovely people reading my blog are normal too. I got sent a few items, there was a sheet of felt, a piece of card, a card, some hearts, some foam stickers and some glue. I had no idea what to do, I didn't want to make a card because that's obvious and I didn't want to make a pillow, so I went to my arts and craft supplies. I pulled out some pipe insulation and some wool and I created this. I swear the last few weeks have been easier with meal planning for me. I think pretending (who am I kidding, there is no pretending) that we're being extra budget conscious has focused my mind a little more clearly than normal! Daddy is cooking tonight (I make the most of him, when he's around) and making Pizza for us. Top Ender will more than likely eat with my Mum and Big Boy has a party this afternoon that should give him enough food to last until next week! We have the Missionaries coming over for dinner this afternoon (we've invited them for a proper Sunday Lunch) and we're having roast Chicken. We know that the Missionaries are always hungry, well in our local area they are, so there'll be a lot of veggies, potatoes and yorkshire puddings to add to the mix and we'll knock up a quick crumble to go with it all too. Any leftover crumble will accidentally find it's way in to my breakfast bowl tomorrow. It's Brownies night, I've got a lot planned during the day and we're going to need to eat fast. So some Slow Cooker Jacket Potatoes are on the menu, served with beans. Unless you're me, in which case no baked beans, because they are really not a food I enjoy. The children love Toad in the Hole, and I love making it. As long as it isn't our gluten free version, as I can never make that rise enough. Luckily the non gluten free version is good enough for the children and I and if there are any beans leftover from last night it uses them up, although I'd much prefer onion gravy. You've guessed my theme for the week right? I have a lot of baked beans to use up. The beans, have a bit of a BBQ hint (which is enough to get me to eat them) and are mixed with a little onion and bacon making this a seriously lush dinner. Tonight, we're having my version of it. I'll cook up some rice, add some veggies, some of the bacon from yesterday and of course some egg! We're having a treat tonight and having a proper casserole with dumplings. Top Ender and Big Boy will be rather pleased as they love dumplings, and I'll be pleased because it'll have been cooking on low all afternoon and the house will smell TERRIFIC! Just before Christmas, Waitrose were really lovely and gave me a great gift. Along with the DVD of Miracle on 34th Street, and a lot of snacks, they gave me this rather fantastic Turkey Timings for a 5kg Turkey, which is what we had at Christmas. Now, whilst I didn't follow this plan exactly (we spent time visiting with our families), I can safely say after having followed it again with a roast since Christmas, that it works out rather brilliantly. Of course, my prep for Christmas today isn't going to be about getting the Turkey, but I'm going to throw Miracle on 34th Street on and I'm going to start writing my gift list for friends and family for this year. I'm also midway through Valentines Surprises, so had better get moving with those! Do you prepare for Christmas all year or am I alone on this one? Let me know in the comments, how you prepare before the big day and give me some ideas for gifts that will store well in my gift cupboard! Every Sunday evening, we prepare our living room to be turned into a cinema. With the projector ready, tables and comfy chairs pulled into position in front of our cinema screen, we sit ready to watch a film. Sometimes it's a classic film that Daddy and I think the children will enjoy, other times it's something that we've been sent to review, or a new release and sometimes it's a film which we love as a family. Of course, a trip to the home cinema isn't complete without a bowl of popcorn or a hot dog or two, and if you saw my Wordless Wednesday post yesterday, of some Hot Dogs that we had for our evening snack during our last Sunday Film Night, you might be wondering how I did that. Just in case you didn't see it, take a look below, they look cute right? 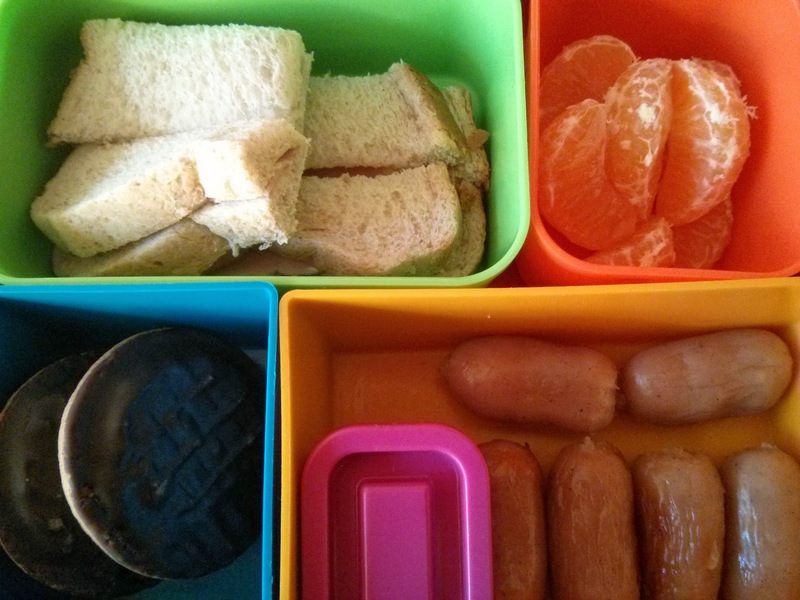 The great thing about these Hot Dogs is that they take seconds to prepare, but look so great and are fun to include in lunch boxes too. I'm using some Jungle Dogs, that I was sent to do my tutorial for this fun food. First gather your equipment and Hot Dogs. I prefer to use my metal skewers, but you could use wooden ones and after a dozen or so, you'll feel confident enough not to use a skewer at all. 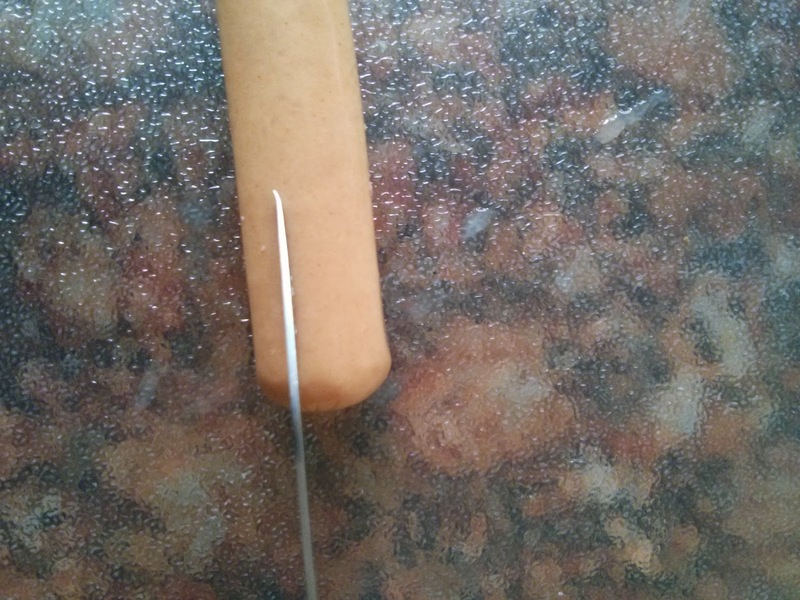 Insert the skewer into the end of the Hot Dog, and gently guide it through the dog, until it reaches the other end. 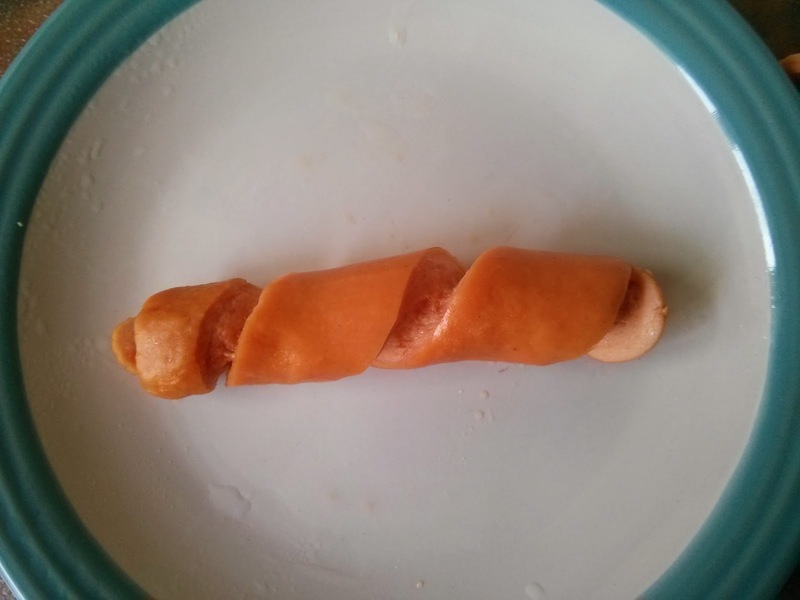 Of course it doesn't have to be perfect, but if you can it's better to have it straight up the centre of the dog, and hot dogs will generally let you rethread the skewer a few times until you're happy. 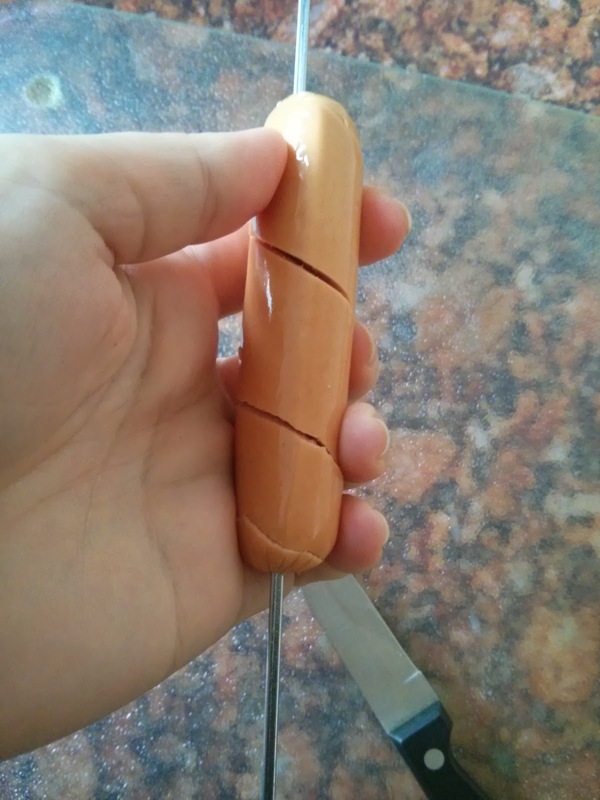 Take a knife and then holding it at an angle, cut through the skin of the dog, be careful not to cut too deep or the dog won't spiral, but you'll have lots of little bits of Hot Dog. Pull it off the skewer and then cook, either by boiling, grilling, throwing on a BBQ or putting in the microwave. 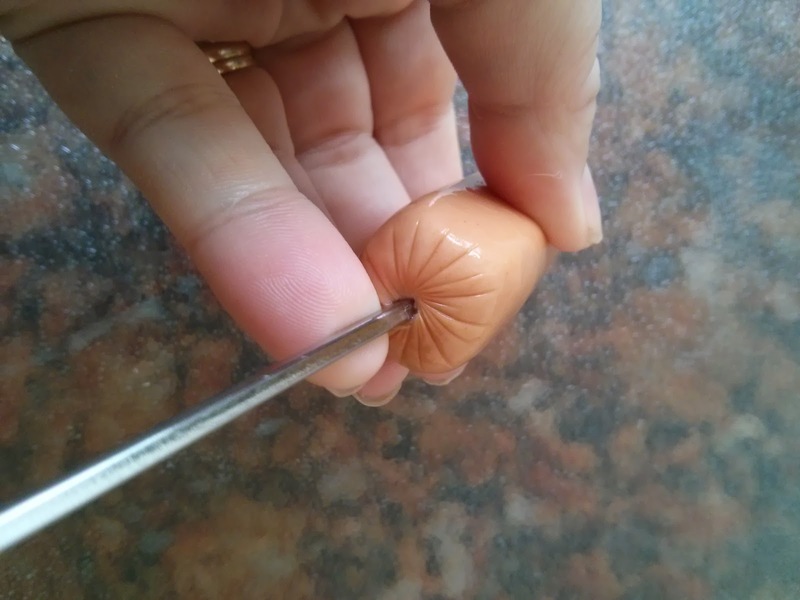 Take a knife, and eyeball where you want to place the first split. I like to have thinner outer "claws" and a thicker middle "claw". 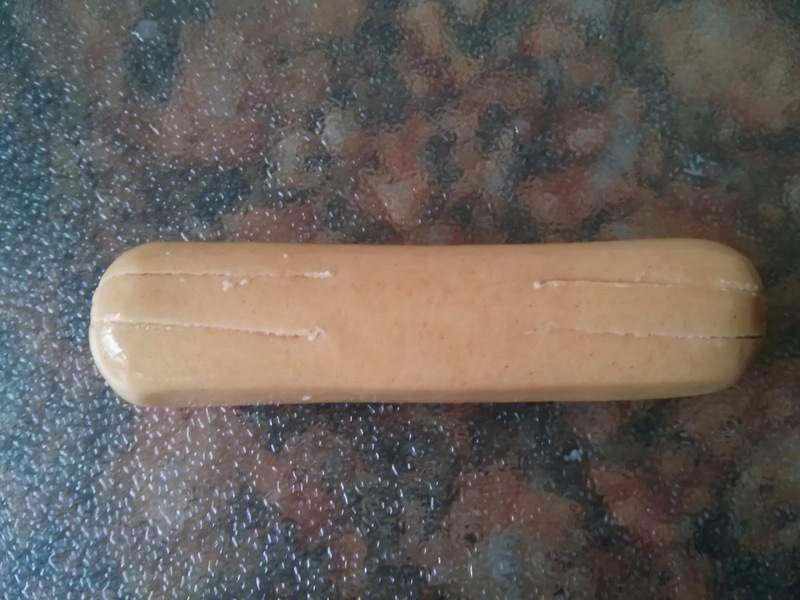 Cut from one end of the Hot Dog to roughly one third of the way up. 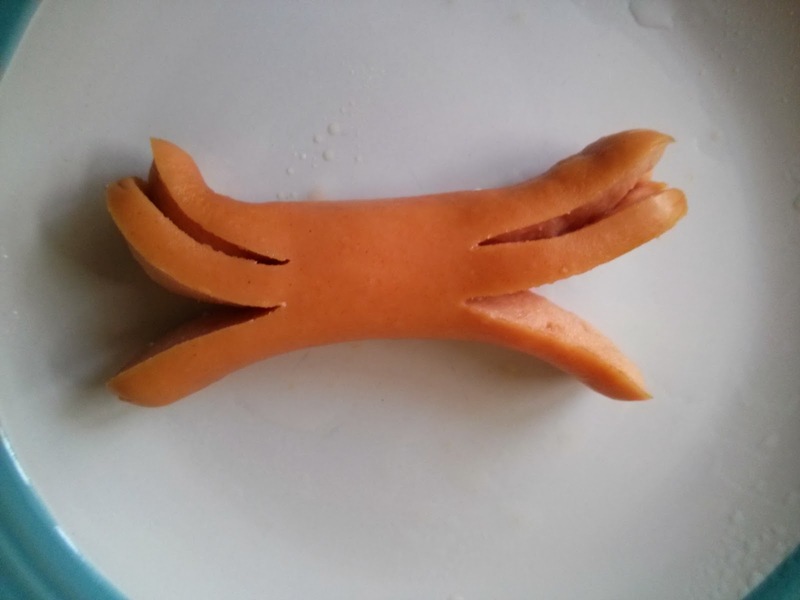 Cut the other claw and then repeat on the other end of the Hot Dog. Cook, either by boiling, grilling, throwing on a BBQ or putting in the microwave. I've served Hot Dogs in a variety of ways, there was the Hot Dog Dog Rolls, grilled them on an open Eco fire, chopped up in lunches, with Spaghetti stuck in them, a hand, wiggly worms, as little birds, and even wrapped up as Mummies! 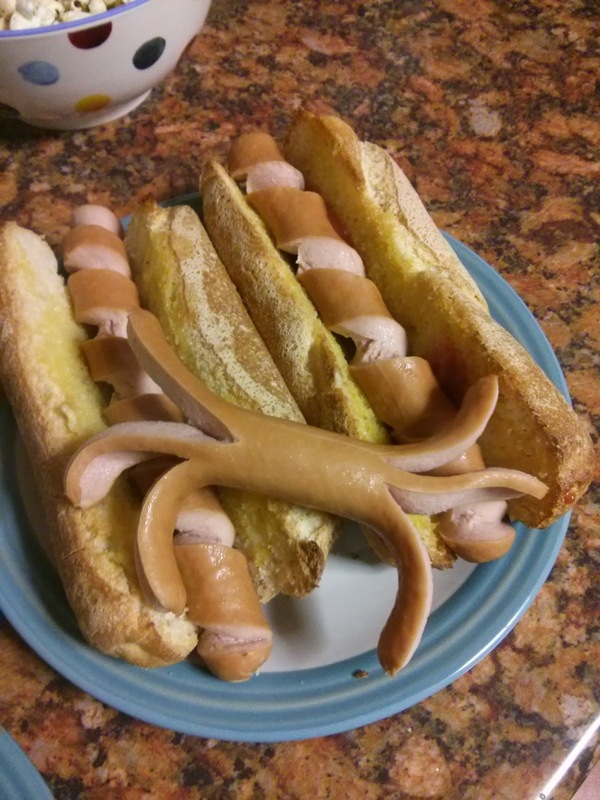 What other fun ways can you think of cutting and serving Hot Dogs? 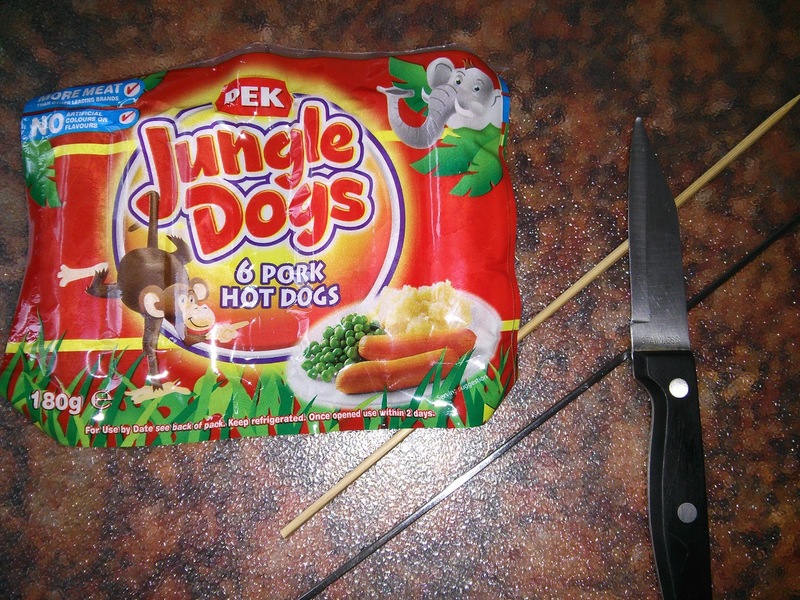 We were sent two packets of the Jungle Dogs, my children have loved them. 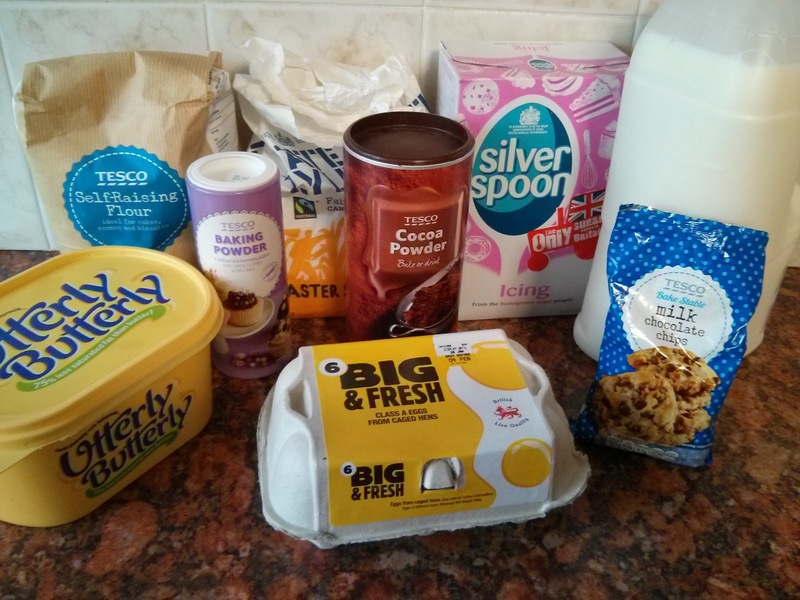 "Lets make a cake Mum. We can weigh the flour and the sugar and the butter and the eggs, we can measure the size of the cake pan, we can check the number of ml in the milk and the baking powder and the cocoa powder!" It was a brilliant idea, so we decided to make a Maths cake, one that Top Ender could measure and hopefully bribe her teachers with for a good grade come Monday. 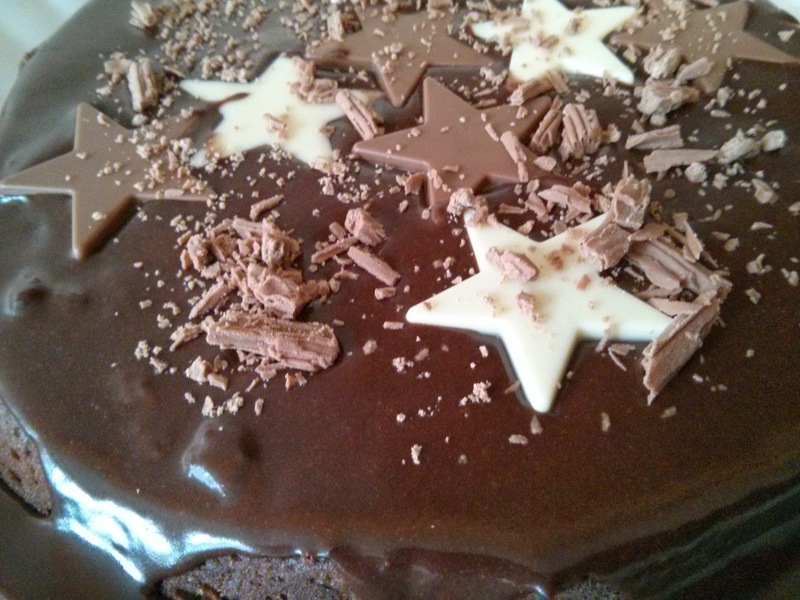 And here it is, our Chocolate Maths Cake. With a cake that beautiful looking, I knew we had to share our recipe, so here it is. Why not make it with your children to get them practise their Maths skills? Cream together the caster sugar and eggs. Add the Flour, Baking Powder and Cocoa Powder and mix well. Add the milk and the butter to a small saucepan, melt the butter, but do not allow the milk to boil. Stir well. 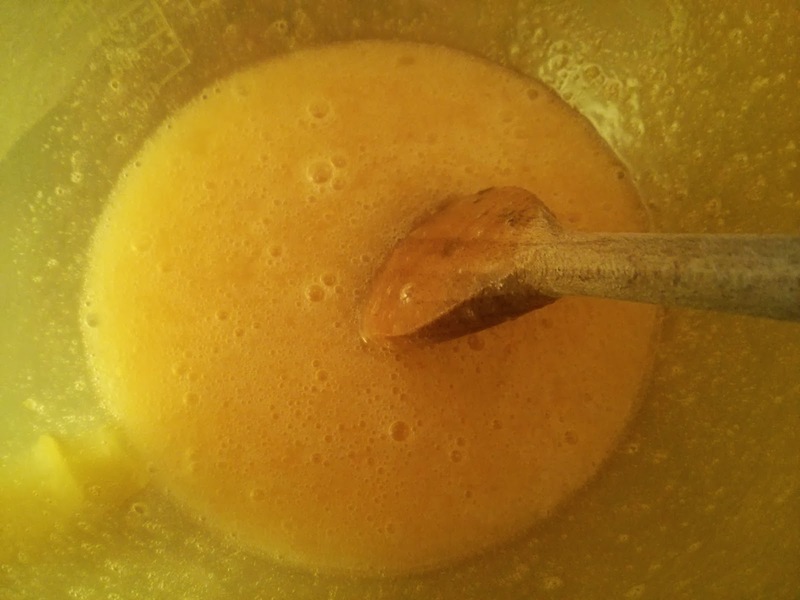 Add the milk and butter mixture to the other ingredients and mix well. 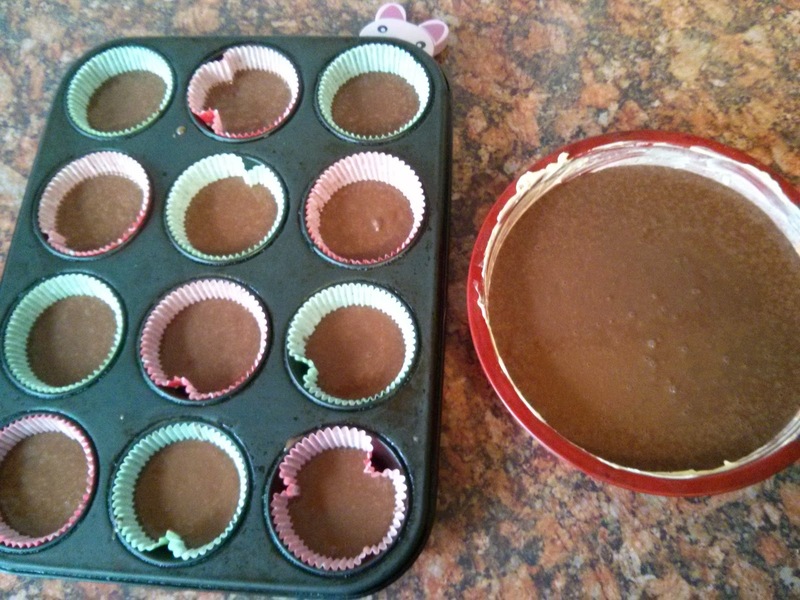 Divide the mixture between two greased cake pans, or make a dozen fairy cakes (easier to give to a teacher!) and one large cake (to eat at tea with your family). Cook in the oven at gas mark 4 for twenty minutes if you're making fairy cakes, 35-40 minutes if you're making the large cakes. Once cool, if you're clever then use a butter-cream icing to make beautiful swirly icing on top of the cakes or if you're like me and when you ice the top of a cake it looks like something that the top of a cake shouldn't (see here, but don't laugh okay!) then mix together the icing sugar, cocoa powder and milk to create a thick icing to spoon on to the top of each fairy cake. For the large cakes, spoon the icing on to make it all drippy and delicious before decorating with coloured chocolate beans (yes, I mean Smarties or similar!) 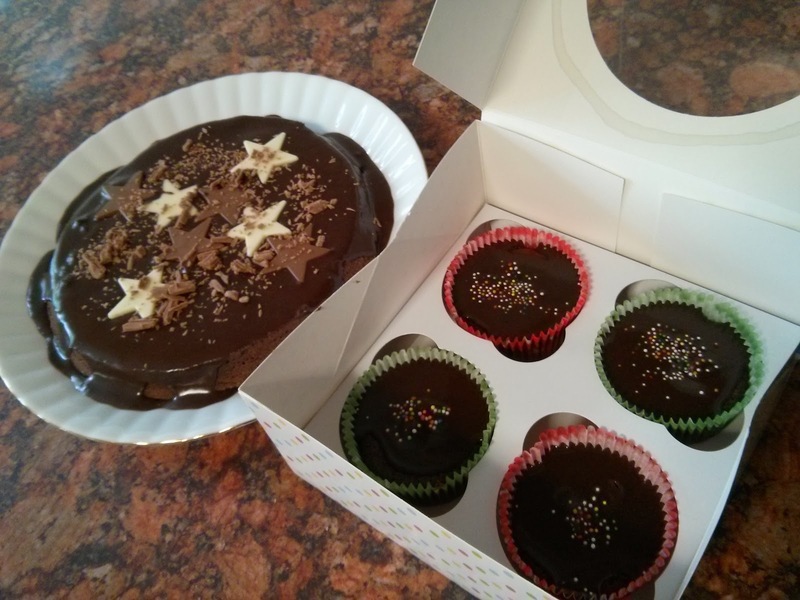 or chocolate stars and sprinkles like we did. Last week, my plan for turning our leftovers into a meal the next day worked so well that I'm planning on doing it again this week. I'm also going to try and use up what is in my freezer, because as you know I've been trying to be extra frugal this month, and I'll try to keep that up for the rest of the year too. I saw a pin on pinterest, which asked for the recipe for "I don't care" or "Whatever you like" as that is what the family had asked for dinner. It made me laugh as that is what my family say ALL THE TIME. I've decided that tonight we're having Salmon and boiled potatoes with vegetables. We have a Chicken Roll in the freezer, which we'll roast for lunch along with home made Yorkshire Puddings (Gluten free and egg free of course), some stuffing from M&S that I got for Christmas and we didn't use, the usual selection of vegetables and some lovely roast potatoes. I know my family and there won't be any leftovers, which is fine because I know how much we enjoy our Sunday Roast! I love Baked sloppy Joes (or sleepy Joes as they are supposed to be called now) and it's a good Monday night dinner when everyone is rushing off to various after School clubs. Well, in my house it is at least. 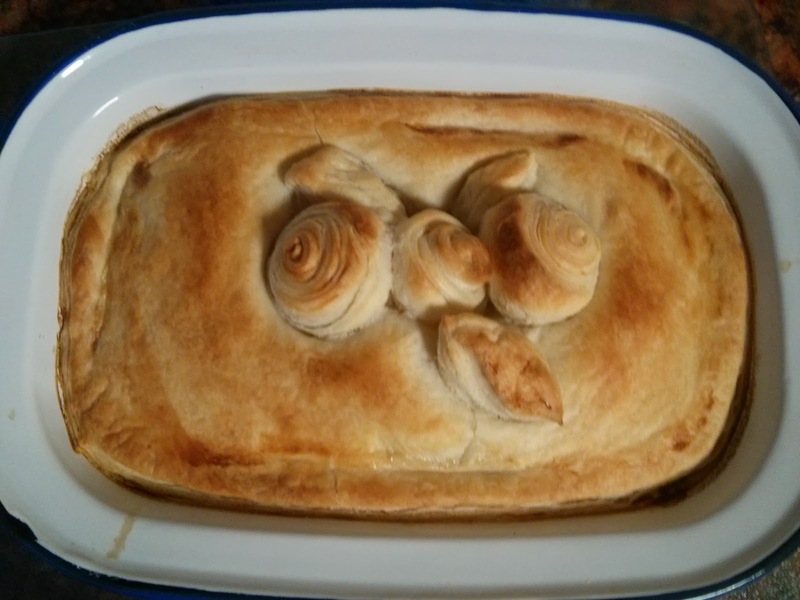 Following on from the success of last weeks pie, I've decided we'll have a pie again this week. I've gone for the classic Mince and Onion Pie, which when topped with some Puff Pastry, should please the children. Honestly my soup maker makes so much soup these days, it's stupid! The thing is the soup it makes is so great, I can't help but use it! This is an adaptation of a dish my sister makes, it's quite simple as you just mix some uncooked rice into a can of soup, add some water and seasoning before putting the chicken on top of the rice mix and bake in the oven for about 45 minutes. Once it's cooked, you remove the chicken from the top of the bake, stir the rice and then serve. I'll aim to do this dish with just bacon, but if there is any leftover chicken from last night then I'll add that in too, otherwise it's simply some creamed cheese mixed in with a few added ingredients I find in my fridge! Let me just start this letter by letting you know that it's not you, it's me. And yes, I know that is what your High School girlfriend told you but this time it's different. I really mean it, unlike that ungrateful first love of yours. I've loved you for longer than I've loved my husband, and that's a pretty long time right? We have had, such a great relationship and I like to think that it is fate that our names are so similar. Hey, do you remember that time I hugged a case of you in Costco? The looks we got from the staff that day, but they must have been young and in love once and I'm sure that if they had taken a second to stop and think they would have realised that our relationship was just the same as theirs had been and we wouldn't have been thrown out of the store. I know we broke up a few times, and yes, as you've suspected it wasn't a coincidence that it was always around Lent and New Year. I always came back to you though didn't I? Even after that year break, where you and I didn't talk, I came back to you. I can't tell you how much I missed you that year, or how good it felt when we made up but I know that sometimes I need to get you out of my head, out of my system. The problem is that I'm addicted to you, and like every unhealthy relationship it's not good for either of us. Well, I know you don't have a problem with it, but I do because I know that it'll ruin our relationship in the future if I don't get a handle on it now. Hey, I just remembered that time that Sally brought a couple of bottles of you for me to have at the first MAD's, because she knew I drank you and not wine. That was such a crazy night, wasn't it? I know you and I were totally flat the next day from having partied so hard the night before. Still we have the photos to look back on. Anyway. I'm supposed to be talking to you seriously about how we're going to have to cool it a bit. I know that I brought you home the other week and that since then you've been hidden away. It was a sort of test, how long could I go without rushing to you. I have to be truthful, I've been seeing someone else. It's a Pixley Berries cordial but it's not serious. I mean she's great, you'd get on really well, actually I bet you two would mix it up pretty great. It started off as just a casual fling, I was just testing the waters after a PR suggested her as being someone I might like to meet. She's quite grown up, she's the kind of thing I could happily spend an afternoon with, when I want to remember the Sun and be a little more mature than I am with you. And look at her, isn't she beautiful? Look, what I guess I'm really saying is Dr Pepper I love you, I have always loved you and I always will love you. I just won't be seeing you as much this year okay? 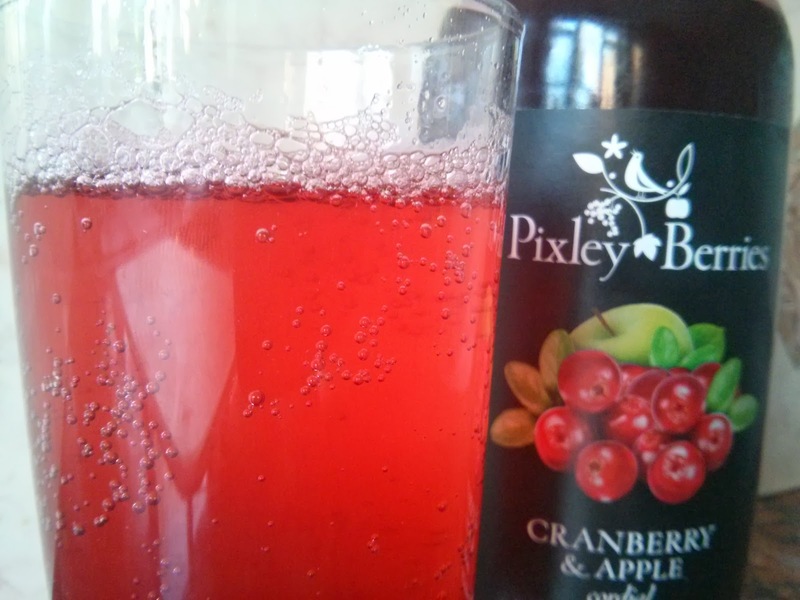 PS I was sent the Pixley Berries cordial to review. One of the things that Big Boy's Type 1 Diabetes diagnosis highlighted was that I needed to understand more about food. Sure at School, I'd had Home Economic lessons, where I learnt how to make various dishes and calculate the calorific values and I think there was probably a bit about balanced diets but between leaving School and getting married I mostly forgot all of that. 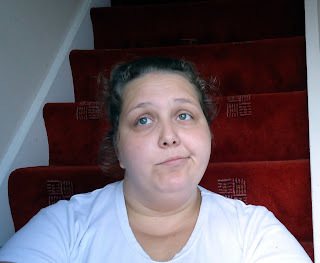 Then with me trying to lose weight and get fit (I'm still chatting about it occasionally over at Pippa World) I realised there was a lot more to it than I thought. Then with BB's diagnosis the carb count of every food became important as it is that figure we use to calculate the amount of insulin he should have before each meal. Now, I don't normally like to generalise like I'm about to but, in my experience boys are always hungry. It seems to me that I could give BB his breakfast and within ten minutes of finishing it he'd be asking for lunch, and thanks to my regular visits to the Dietician (just to check what we're doing food wise is good) I know that the portion sizes I'm giving BB are the right size so technically he shouldn't be hungry. How do you tell that to a five year old though? 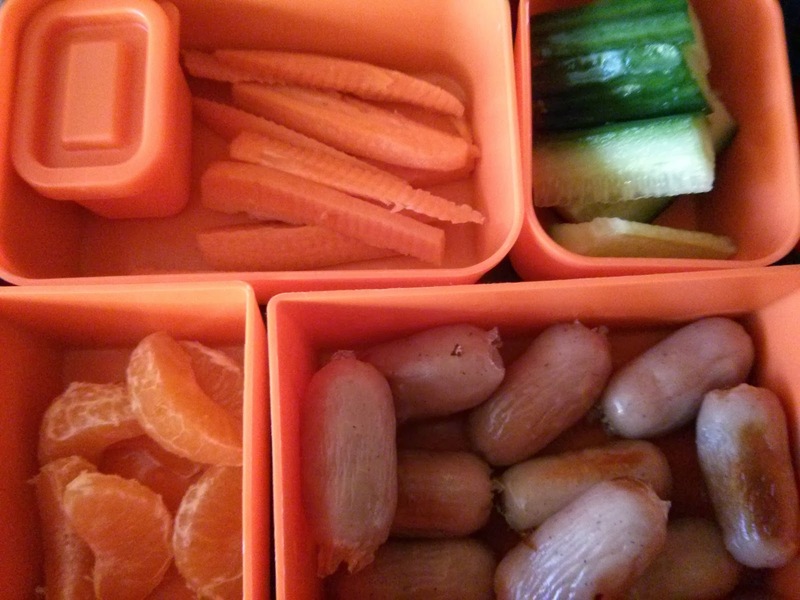 Through trial and error, I worked out that giving BB a lot of little things to eat works well and this is where a genius lunch box system came into play. As most of my regular readers (Hello Friends!) 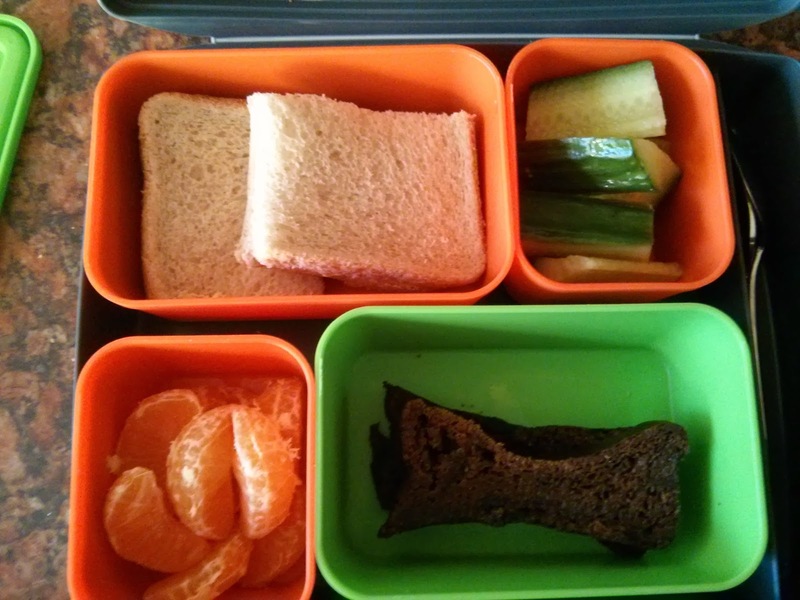 know, I love making little fun lunches for Top Ender and Big Boy. They really don't take that much longer to make, and having something fun to eat makes me smile, so I hope it does the same for my children. 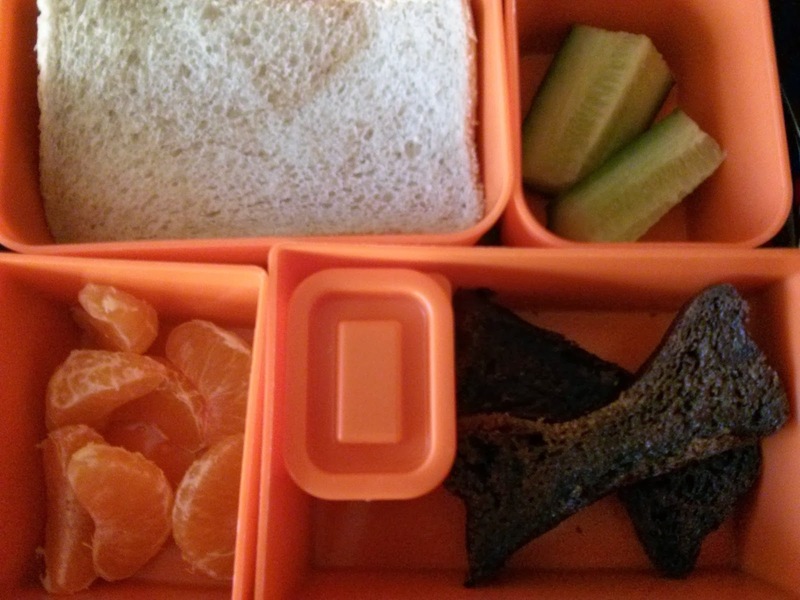 Out of all my favourite lunch boxes, the ones I love the most are the Bento style ones. This is because they feature a little of a lot of foods and so are perfect for the ever hungry Big Boy. 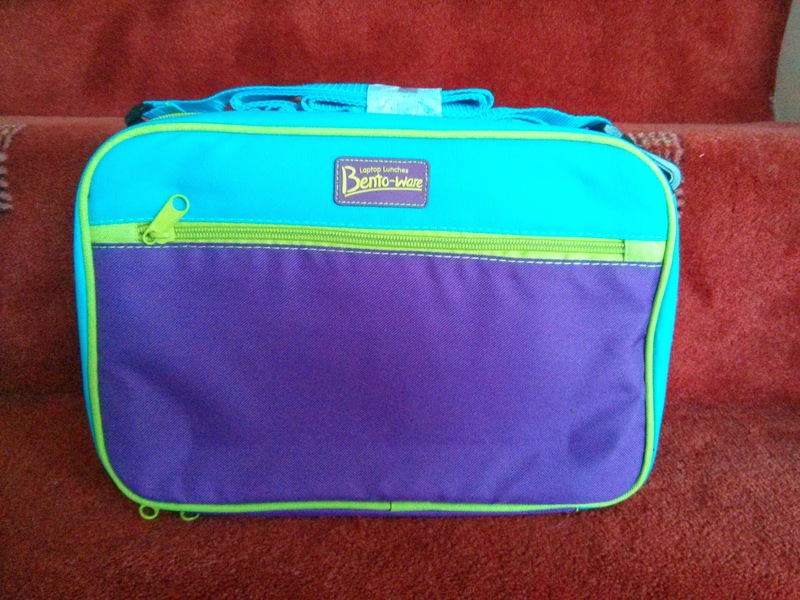 When Laptop Lunches asked if I'd like a laptop Bento lunchbag for both Top Ender and Big Boy, I was thrilled and even more so when they gave me another one to giveaway! Now, we've had the bags since the start of the School year, and for almost four months they have been in constant use. 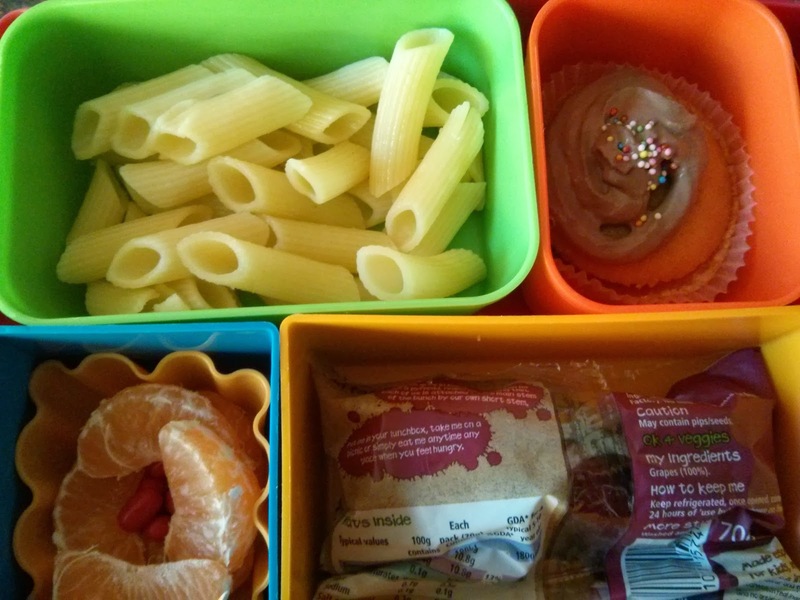 The children LOVE the boxes, they know that each pot has a different treat inside, and because the pots are so small they know that if there is something inside that they don't like, that it'll all be over in a couple of mouthfuls anyway. 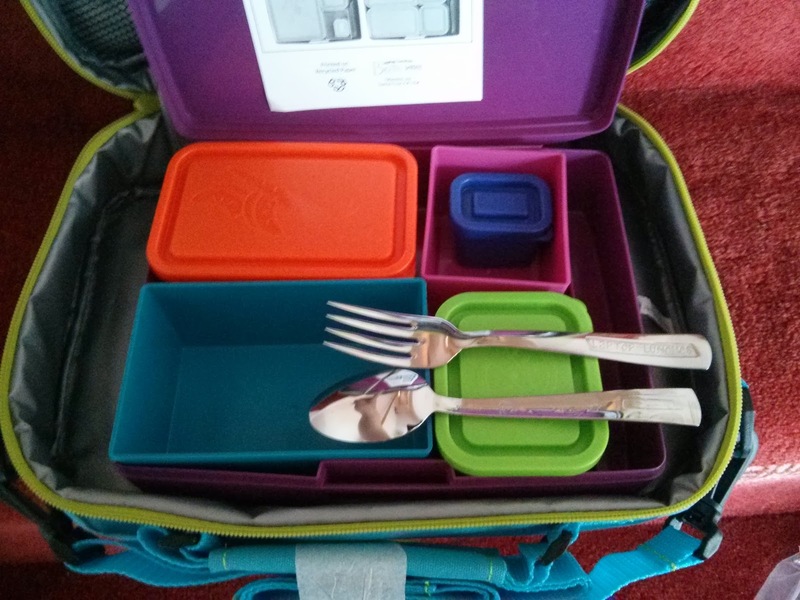 There are hundreds of things I could say about the lunchbox. 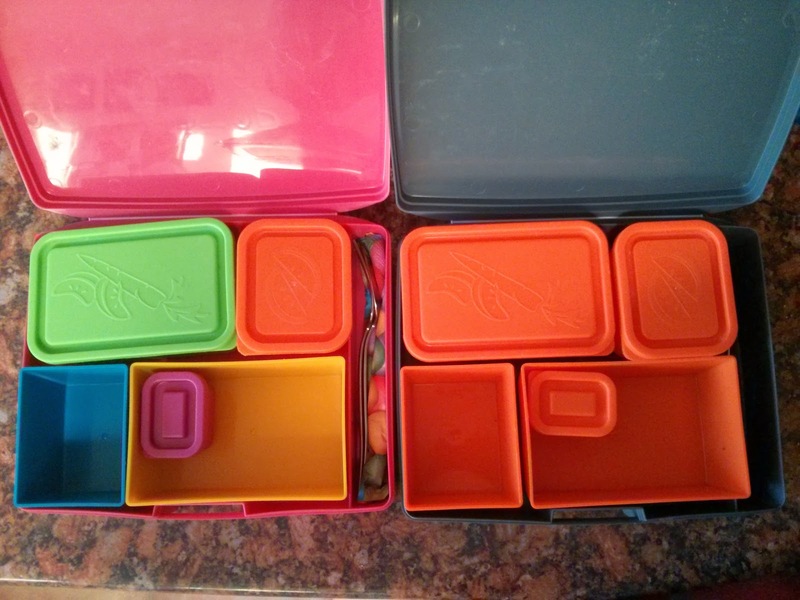 I could say that they are reusable, recyclable, long lasting, and dishwasher safe or that they don't contain phthalates, bisphenol A (BPA), PVC, or lead, but really all I worry about with regards to what they are made of is do they stand up to the rigours of a five year old and his classmates. Well, they stand up really well. No cracking, no lost bits, no broken bits and no staining either which is even better news, seeing as sometimes I give the children tomato based foods. So in order to win the Laptop Lunches Bento box that I have here, all you have to do is fill in your details on the Rafflecopter widget below and answer the question. There are of course other options, to give you some additional entries and I'm sorry but this is for the UK only, so Good Luck! I'm not sure what the cat though I was doing when I took these photos, but when Google+ Autoawesome auto awesomed them into this video, it was obvious that he wasn't caring what I was doing, he was just watching a little game of Mouse Tennis. It's this scene that comforts me in the middle of the night, when Big Boy shouts for me to come rescue him from whichever monster is tormenting him whilst he sleeps. 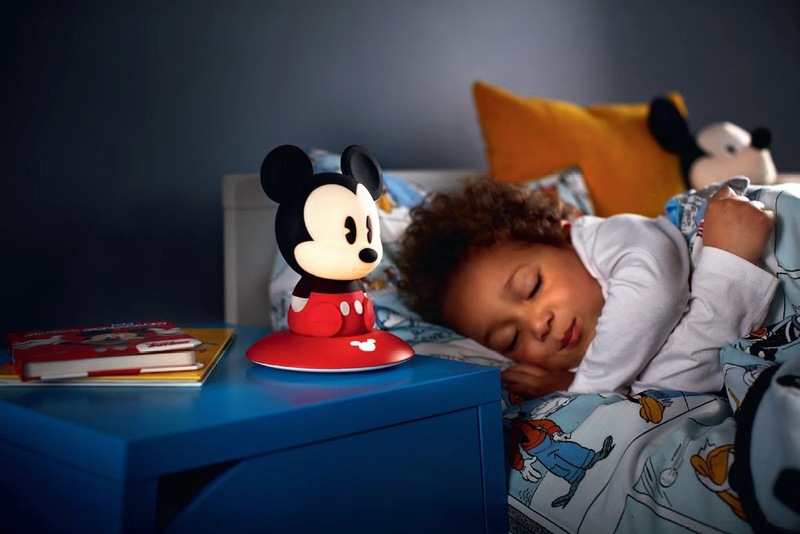 Philips have come up with another idea in collaboration with Disney and have created the Imaginative Lighting range. The range has been focused on four key areas that parents like me find important reading, safety, playtime and sleep and the items in the range will help enhance time spent by children in their bedrooms. I think the lights are adorable, and never mind BB, I think that I'd quite like these in my room! 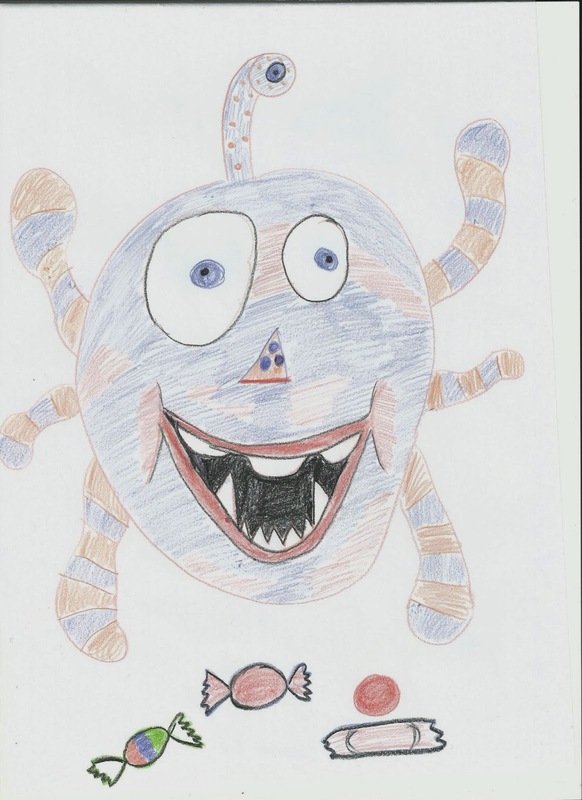 Philips is running a great little competition to win one of three great prizes, and all you have to do is submit a picture of your children's monster drawings to the Facebook Wall, or via Twitter, Instagram or Pinterest with the hashtag #NotSoScary. There will be 10 winners of the 3rd Prize, with each winner reciving a plush toy hand crafted recreation of their monster. (Winners picked by a panel of judges). 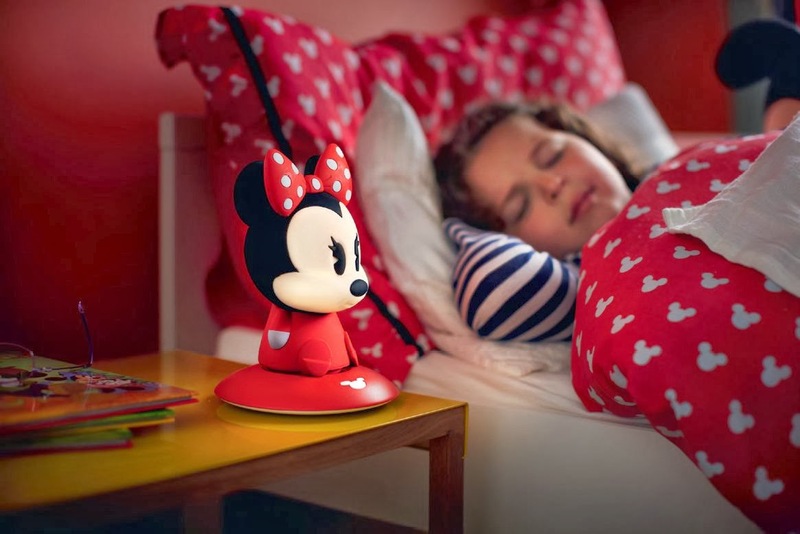 There are 8 winners of the 2nd Prize, who will each recieve a Philips Disney SoftPal, which will be delivered by post. The grand prize is for one trip to Disney Land Paris (for EU Winners) or to Disney world Florida (For USA and Canada). The prize will be 2 day access to the theme part and one over night stay for two adults and two children and travel costs are included. There are of course other T&C's so check them out, but I think this is rather a cool little competition! These are BB's and Top Ender's entries, what do you think? 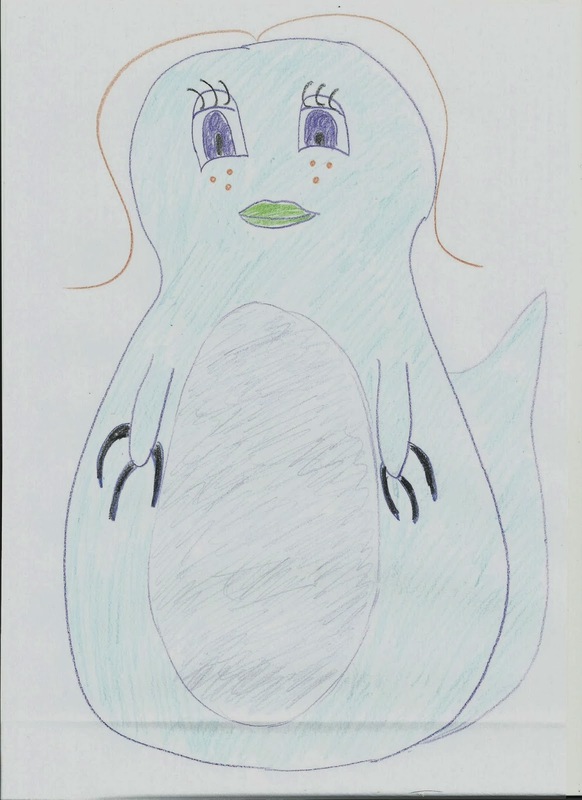 We were given a chance to have our monsters turned into plush toys. I was talking with a Mum in the playground after School on Friday and whilst we were flicking through our diaries trying to find a mutual date that we were both available on, we were chatting about our week. It turned out that we'd both kept our diaries free for the first week our children went back to School as it seems that we'd both had the same idea. As soon as the children were back to School, we were going to tackle the cleaning, the sorting, the clearing and I don't know about the other Mum I was talking to but I know that I went for it with vengeance! 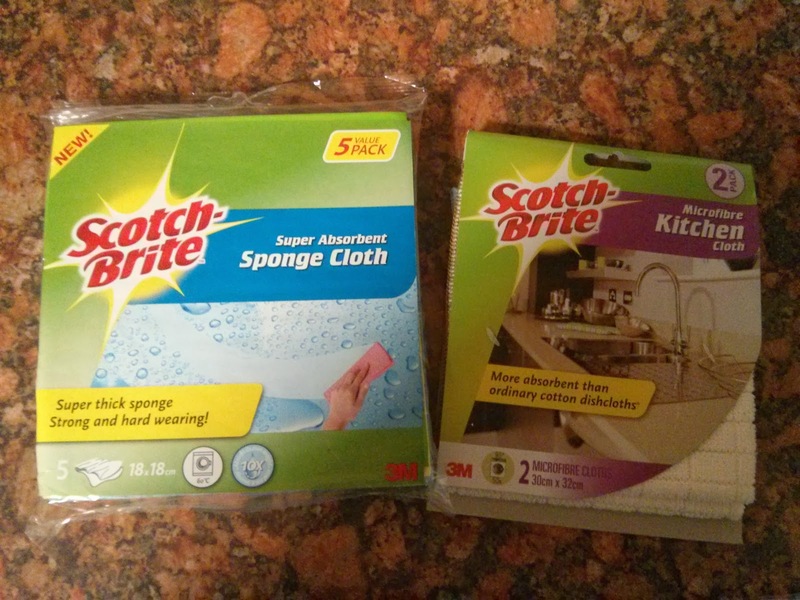 Luckily for me, I had an arsenal of tools Scotch Brite and Scotch Gard had sent me to help. Starting in the Kitchen, I had some sponge scourers, non scratch sponge scourers (perfect for my very expensive glasses! 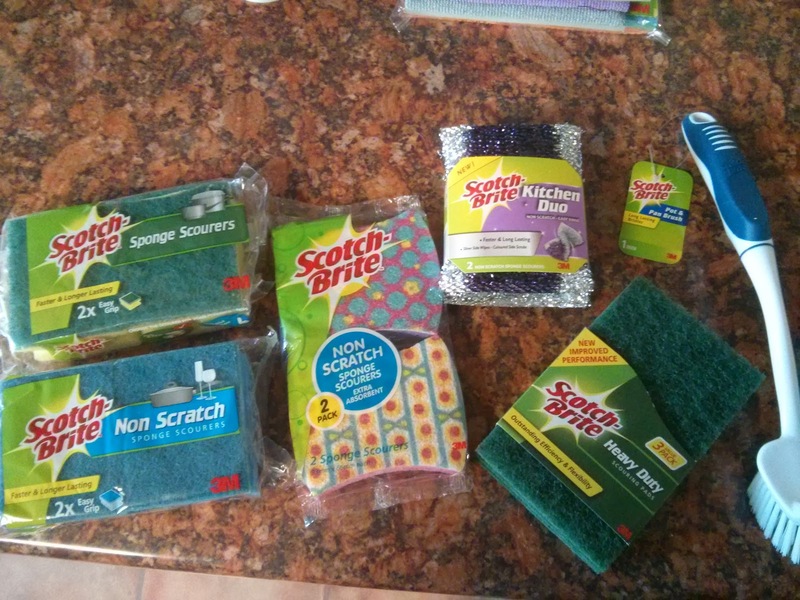 ), colourful non scratch sponge scourers, Kitchen Duo, Pot and Pan Brush and Heavy Duty Scouring pads, a sponge cloth and a Kitchen Microfibre cloth. I swear my kitchen and my dishes have never sparkled as much as as they have in the last week. 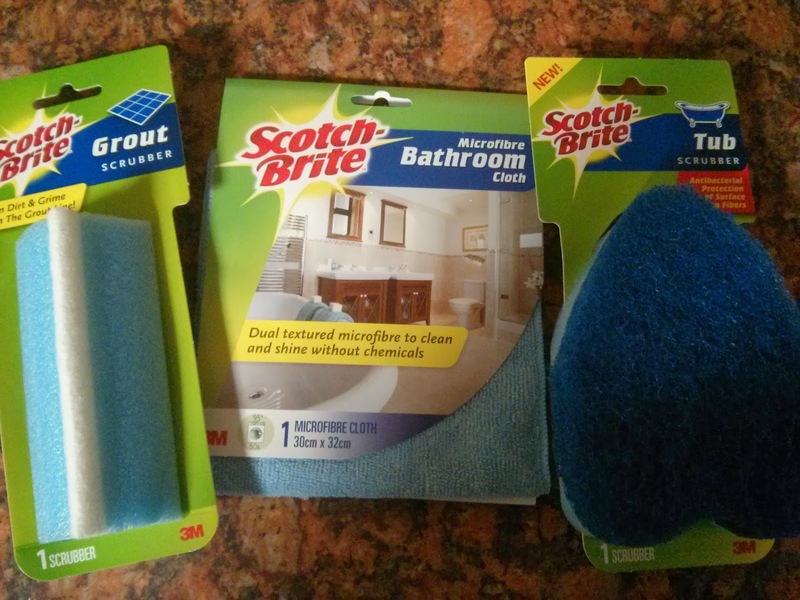 The Bathroom wasn't forgotten, with a grout scrubber, a microfiber bathroom cloth and a tub scourer. 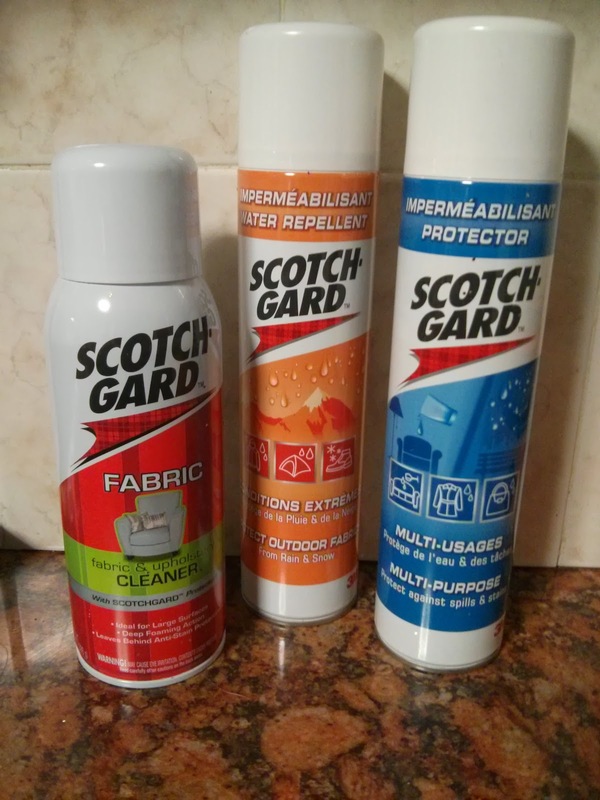 Then there was the Scotch Gard Fabric Cleaner that Daddy used to clean the sofa for me (Thanks Daddy!) and the bedroom floor where one of our cats decided they'd like to "lighten" their load. Thanks Cat, not. And lastly there were the Cleaning and Dusting Microfibre cloth, the Hi-Tech Microfibre cloth and the Window microfibre cloth. All of which have seen more action and been spun in the washing machines more times than I thought was possible in one week. The best bit of all this cleaning of course, isn't that now my house is all sparkly clean again but that with my marathon cleaning stints over the week I burnt off at least 2500 calories a day according to my calorie counter thingy. Yay me! The products were sent to me to review. We've not had Pork for a while, at least it feels like it, so we've decided to have it tonight! hoping that as Daddy is making it whilst I'm at Church that he's going to make a lot, so that there will be a lot of leftovers to turn into dinner tomorrow! I'm taking the leftovers from dinner last night, adding a crust and calling it pie! 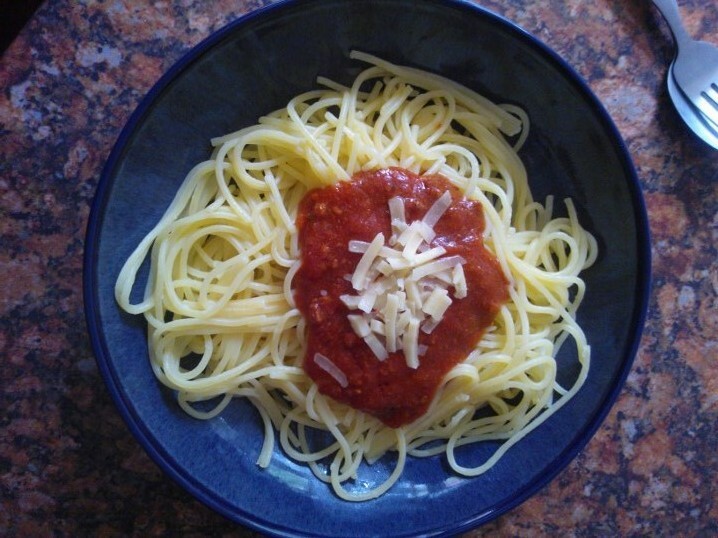 My two love Spaghetti Bolognese, they normally end up covered in tomato sauce and have to sit and eat it wearing practically nothing or they stain their clothes, but they still love it! Tops is out at a friends house tonight, so it's just and Big Boy tonight, so we're having sausages and mash and the leftovers from last night and tonight will be used tomorrow and the Sausages that are left from dinner tonight will be used in Tops and BB's lunch tomorrow! I'm using the leftover mince from the Spaghetti Bolognese and the extra mash from yesterday to make a Shepherd's Pie, which Daddy can have some of when he gets home! He's coming home early this week because tomorrow is his birthday! Today is Daddy's Birthday and he's decided that he'd like a Chinese for dinner. It depends on funds, if we're having a takeaway or something that I make at home, either way is fine by Daddy. If we are eating at home we're going to have a Chicken Stir-fry with vegetables, rice noodles, prawn crackers, and I might be able to make some Banana Fritters for pudding too. So what are you having this week? Before Christmas I had a brilliant idea of what I could get the children as their something to wear Christmas gift. Whilst trawling the internet I had found the most amazing Minecraft Creeper Hoodies, and I knew that the children would love them. The problem was, when I found the ones I was after, they were a lot more expensive than I was hoping they would be due to shipping costs. And then somehow I came across Onesies R Us and I found that they made onesies to order, and even better than that they made Steve from Minecraft onesies. So after measuring the children, I placed my order and waited. I had placed my order after the Christmas cut off, but I was hopeful that the onesies would arrive before Christmas. When they didn't, I was secretly relieved as I knew that if the children had received them on Christmas Day nothing else would have mattered. They finally arrived this week, and both Top Ender and Big Boy were thrilled with their gifts. 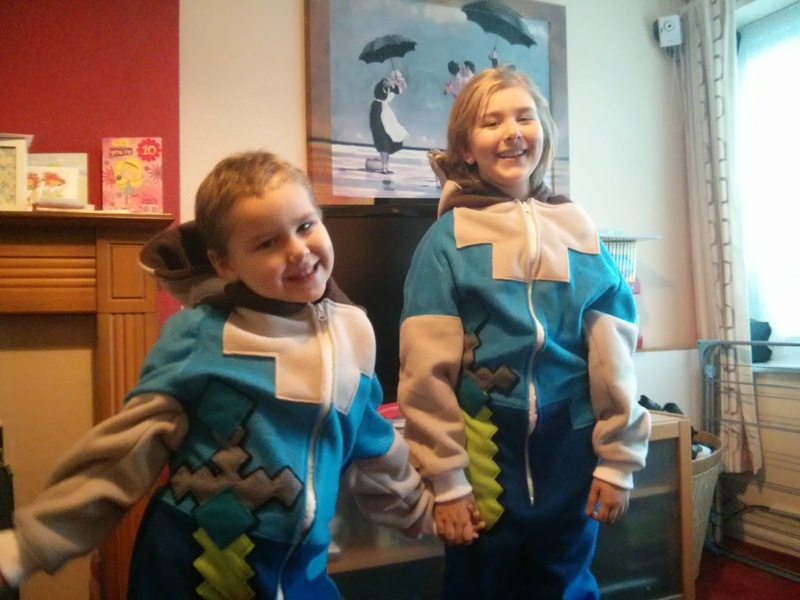 If you're looking for a gift for a Minecraft mad child (or adult) then you might want to go and get a Onesie ordered. I'm thinking I might get me an Adventure time onesie, or maybe even one to wear at BritMums live. 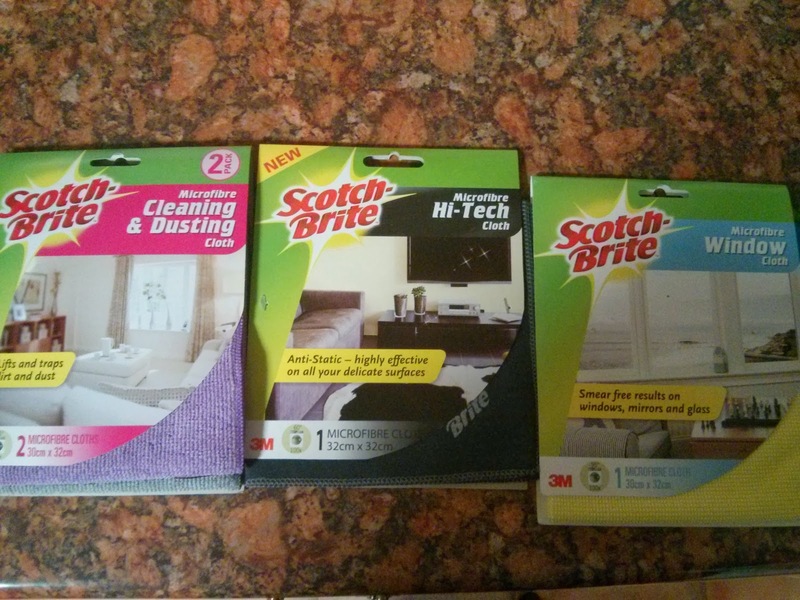 Who knows, maybe I'll suggest they sponsor me to go to BritMums! This is not a review, as in the company didn't give me money off, or ask me to post, or pay me etc. 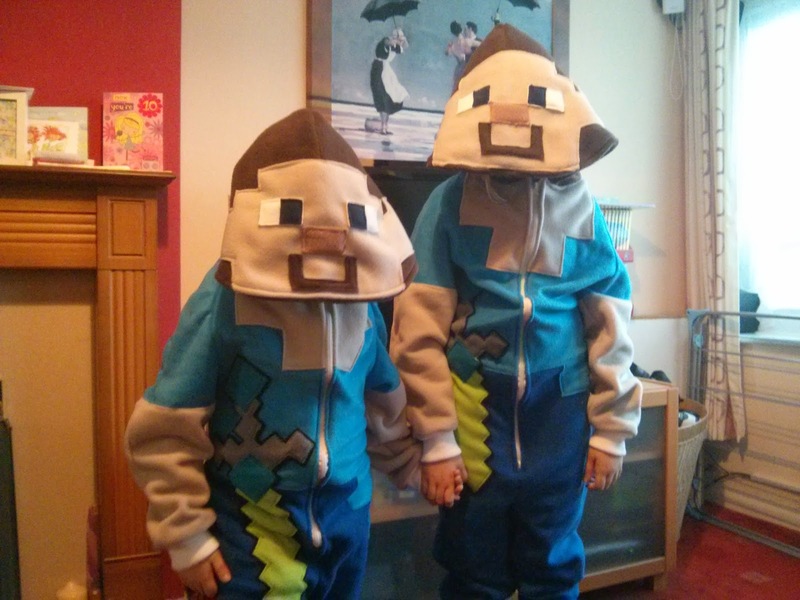 I just thought as a parent of two Minecraft mad children that other parents of Minecraft mad children might like the idea of a Steve onesie as much as I did. One of my friends told me off the other day, and told me I should go sit on the Naughty Step. Apparently I've not been baking enough as they've not had any biscuits, cakes or other things (I'm not quite sure what the other things are, maybe they got me confused with someone else) that I'm trying to palm off on people because I've baked way too many for my little family. She had a point, I have stopped baking recently and mostly because I've been busy with Christmas and playing with the children and I sort of fell a little out of love with baking as I mentioned a few weeks back. 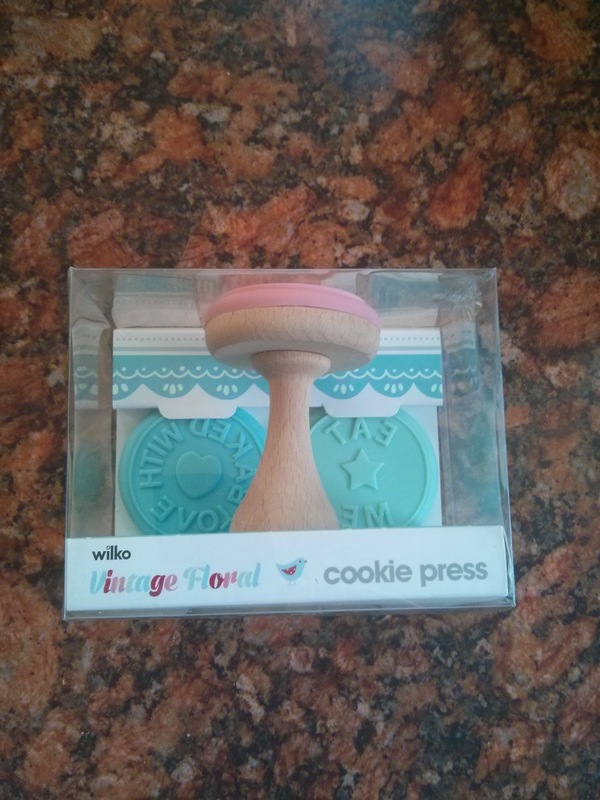 It was going to take something brilliant to get me out of my funk and good old Wilko's saved the day when they sent me this brilliant cookie press. As soon as I had finished baking Top Ender's Birthday cake, I set to work on a gluten free biscuit recipe and soon had fun pressing the three designs on to the biscuits I was making. I did bake the biscuits, but they were a little too crumbly to survive being taken off the baking tray, so I now have a tub of biscuit crumbs that I'll turned into a cheesecake last weekend. 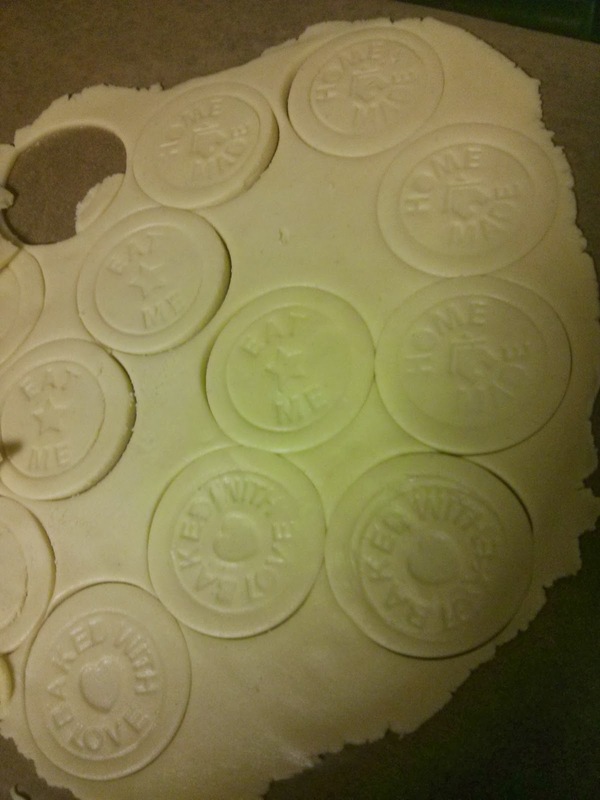 I've had another go with a stronger biscuit, and the prints come out brilliantly. I have a feeling that I'll be pressing these mottos into everything I bake, including mash potato, for quite some time. The Vintage Floral Cookie press was sent to me by Wilko's, I've lost the press release and I couldn't find it online so I have no idea how much it is. What I do know though, is that it's helped me get my baking grove back! At the start of the week, I went to my MIL's to drop something off. 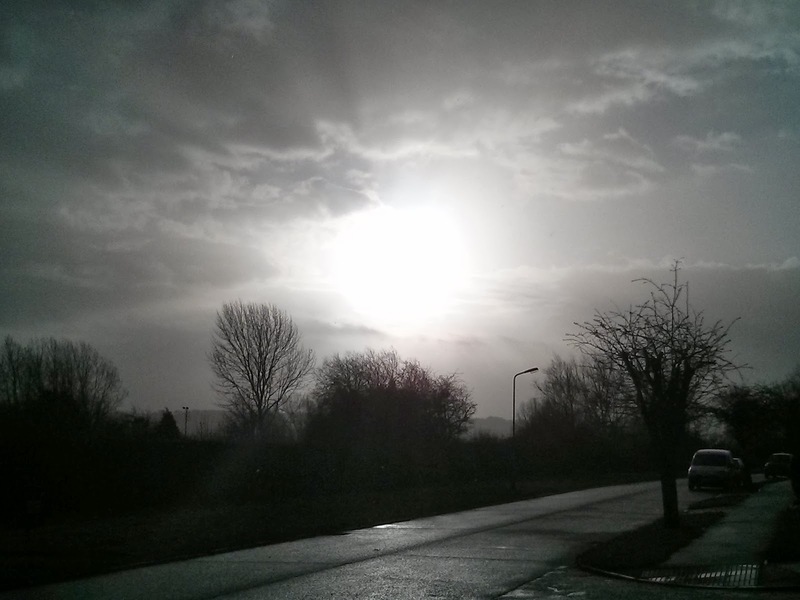 Whilst I was there, the sun started peering through the clouds and I had to take a photograph. The best thing was that the photograph isn't manipulated, it's untouched, but it appears black and white because the sun bleached out the colour from the photograph. Just in case you haven't been over here since the new Year HAPPY NEW YEAR! I'm hoping this year to have some good simple home cooked food with my family and I'm also going to be looking a lot more carefully at budget meals too. This week Daddy is away all week (from Monday), so it's just me and the children after Sunday, until Friday. On a Saturday, we're normally quite busy as Tops and I go shopping with my Mum in the afternoon and by the time we get back home it is dinner time. Beans on Toast with a bit of bacon is something I know that Daddy can cook quickly whilst I'm driving home from my Mums ready to eat when Tops and I get back in. I'm not really in a mood for a roast this week, but the rest of the family outvoted me and so we're having a lovely Sunday Roast. It's Chicken as I have some portions in the freezer! I'm honestly not sure if Brownies starts tonight again or not. Just in case it does tonight we're having simple Beans on Toast, with a bit of Bacon, as we did on Saturday night, because it's quick and filling. Today should be Faith In God night, again I'm not sure yet if it will be on, but I'm planing a meal that hopefully won't repeat on Top Ender if it is. I might thread some spaghetti into the hot dogs, or I might just served them chopped small amongst some other pasta I have in the cupboard along with some chopped tomatoes (raw) and some onion (fried). The children have a choice between Turkey Soup (frozen from the Turkey Leftovers) or Chicken and Vegetable soup. Served with either cheese sandwiches or bread, depending on what mood everyone is in! 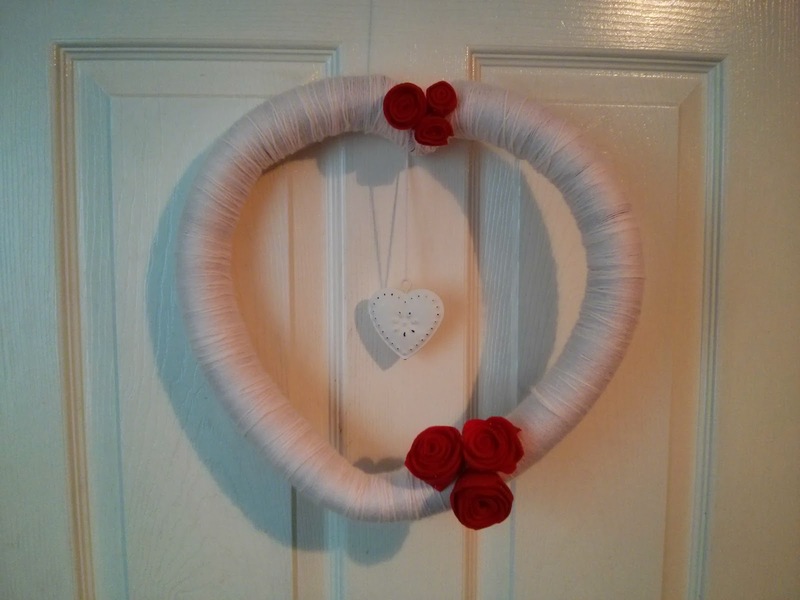 Nice and simple and easy to make and not a lot in cost too. I'm going to make my own tomato sauce to bake the pasta in, and then along with some vegetables and a little mozzarella on top bake it in the oven before serving. A simple casserole, with home baked bread to dip in the gravy, with some mashed potato sounds perfect to me for a family meal on a Friday night. 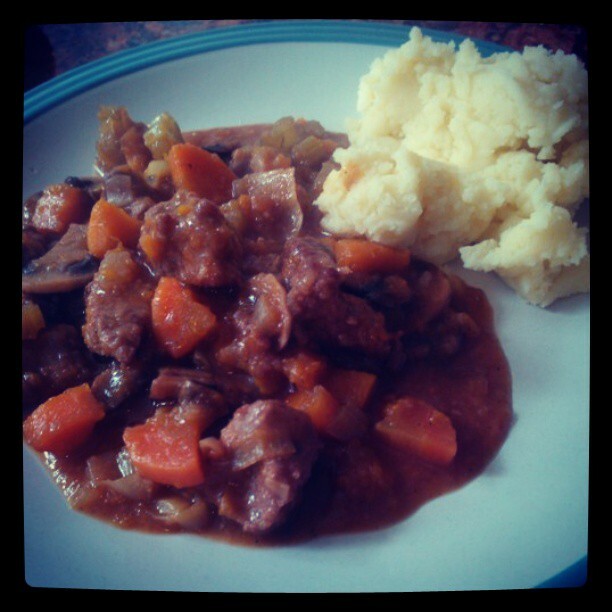 There'll be plenty left over for Daddy to eat when he gets in and it's a good slow cooker meal. So what are you eating this week?